Disclaimer: I am partnering with Allergen for this campaign and I am being compensated for my blog posts and treatment sessions. 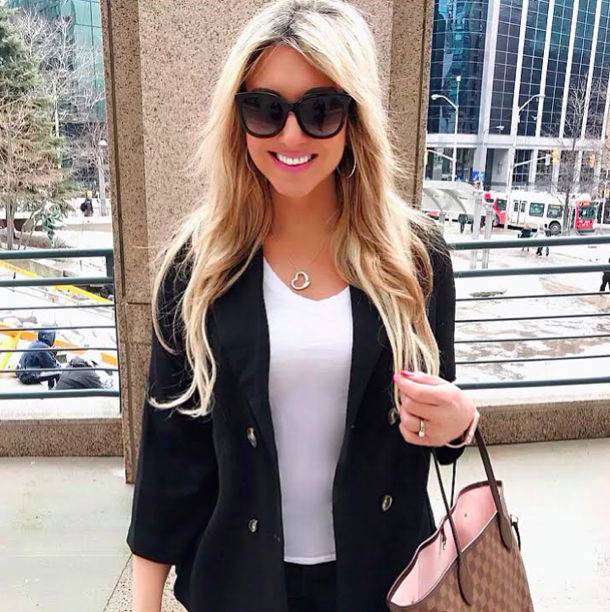 I recently wrote about my consultation with Dr. Caroline Tosoni–a leading medical aesthetics expert and owner of Ottawa's top cosmetics clinic, Tosoni MD. During my consultation, Dr. Tosoni explained the benefits of Juvederm and how long each treatment would last. She answered all my questions (Will it hurt? Can I wash my face and put makeup on after? Is it safe?) and she put my mind to ease. I am thrilled to be working with Dr. Tosoni (and the Allergen team) so I can share my experience with my followers. Many people I know have done wrinkle-reducing injections like Juvederm, but don't openly talk about it. Is it because we associate these procedures with an older demographic? The truth is, women are starting to take care of their skin with Juvederm in their 20's as a preventative measure to help reduce the onset of fine lines. Juvederm can help smooth fine lines and wrinkles when we're in our 30's and 40's, too. I think it's an empowering feeling, to take control of how we look and feel, and do things for ourselves to help enhance our natural beauty. I was scared of my first Juvederm appointment, despite Dr. Tosoni's calm demeanour and expertise. I was nervous for the procedure, as I tend to be wary of needles, but the most incredible thing of all was that it did not hurt–not one bit. I expected some pain, and I was bracing myself, but I felt nothing. It lasted a few minutes on each side of my face, and then the procedure was finished. With Juvederm facial fillers, the results are visible right away, and I was thrilled with my results. My skin is smoother, my lines have diminished, and I feel more beautiful and confident. During my appointment, Dr. Tosoni asked me what I wanted. (I wanted to reduce the fine lines around my face). She talked to me about what treatments would be best for me, based on what I wanted to achieve: a more youthful, less tired look. With a little Juvederm, this look was achieved in just a couple of appointments. I loved seeing the results from my treatments and can't wait for my next appointment! I believe feeling great helps you look great and looking great makes you a happier person overall. When I'm working out, eating well, and taking care of my appearance, from my hair to my body to my skin, I feel like my best self–and skin treatments like Juvederm help me achieve this. It's a personal journey for everyone, and it's all about a customized approach. For more information, visit Juvederm.ca. What kind of Juvederm facial filler products are there? Juvederm Ultra is great for filling in mid-dermis, for treatment of superficial lines. Juvederm Ultra Plus gel is for deeper wrinkles and augmenting areas like the cheeks, where skin is thicker and the product is placed more deeply. Juvederm Voluma is used to restore fullness for a more youthful look. Juvederm Volbella is used to bring fullness back and shape the lips as well as treat skin depressions in the under-eye area. Juvederm Volift is used to soften and restore natural-looking volume to smile lines. What Juvederm product was used on you? For my first Juvederm appointment, Dr. Tosoni used Juvederm Voluma. It really was not painful at all! Juvederm contains paint-reducing lidocaine. You can feel the needle going in, which doesn't hurt, and then you don't feel anything at all. It's just a bit of discomfort, but barely. I love that treatments deliver instant results, and minimal recovery or downtime. Juvederm has been clinically proven to last one to two years, depending on which product you use. The treatments are also reversible, if you don't love your results. (But seriously, what's not to love about smoother, more youthful looking skin?). The key ingredient in Juvederm is hyaluronic acid (HA) which is derived from a naturally-occuring sugar in the body, which combines with the water in your skin to smooth lines and wrinkles and add volume. If you have any additional questions, let me know! I'd be happy to answer them for you. I loved my experience, and would highly recommend this for anyone looking to enhance their natural beauty.